Before I begin this post, let me first provide a bit of a disclaimer. 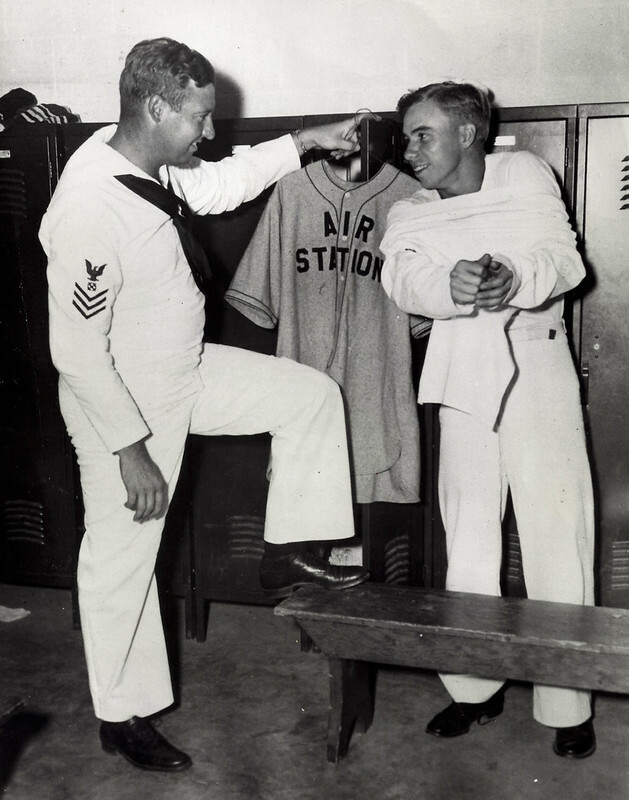 I would not characterize myself as an expert in military baseball. I have been acquiring a significant amount of information in the past 5-6 years that I have been more heavily focused on this particular genre of collecting. With the scarcity of military baseball items that surface in online auctions, estate and garage sales, antique stores and from other collectors, I am left with very few options when it comes to building out a well-rounded collection. I now have several vintage uniforms and jerseys, a few gloves, a ball cap, dozens of photographs, a few pieces of ephemera, spikes and a (U.S. Navy softball) bat. Throughout my time collecting, I have been searching for the one item that one would imagine to be prevalent in a baseball collector’s cache. However, due to their seemingly non-existence, I do not own an authentic military baseball. eBay seller giscootterjoe has quite the cottage enterprise in play. With three bids, it appears that he has a few fish on the hook. This ball bears not one single aspect that would lend credibility to the seller’s assertions as a U.S. Army Special Services baseball. (eBay screenshot). I suspect this ball has a distinct coffee odor. In my years collecting baseballs, I have never seen genuine game-used balls look like this (eBay image). Low quality images and nothing taken close-up help to conceal the absence of manufacturer’s markings. (eBay image). giscootterjoe’s bag-o-balls has no bottom. If one looks at his history and the dozens of sales (some selling for more than $120), he can keep stamping, dying and shellacking balls for decades (eBay image). In the past few days, a fellow collector posted a question in one of the online discussion forums, where I am a member, regarding the veracity of a baseball in an eBay auction listing. The listing purports the baseball to be from the Special Services, U.S. Army, used during World War II. The collector who posted about the listing has obvious concerns about the veracity of the seller’s assertions. His concerns are absolutely warranted. Reiterating my level of expertise, I do possess a certain measure of reason and the ability to observe. Besides being a collector, I also played the game as a kid, service member and civilian. I have held more baseballs in my hands than I could begin to count. I know what normal wear and tear looks like on a baseball. The scuffs, grass stains, bat imprints, dirt marks, etc. all present themselves on a ball in the same way with game use or just in throwing and catching between a couple guys. I have a bag with balls that were used during batting practice at my local AAA minor league ball park that I gathered from the stands and parking lot from when I moonlighted there in the early 1990s. Also, I have a collection of pristine signed baseballs along with a few other game-used balls that were signed by players (at the same stadium) in the 1960s and ‘70s. 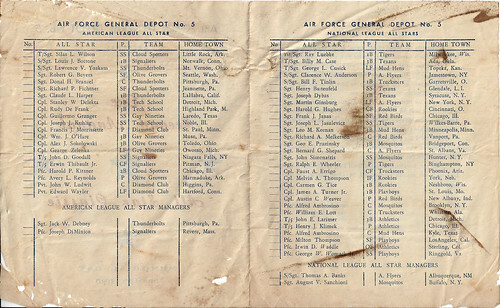 Furthermore, I have watched and bid on baseballs that had rock-solid provenance – game-used and autographed – that came from the collection of an umpire who officiated the championship games between the Army and Navy and between the American League and National League military players in Hawaii. There has been a smattering of other signed game-used balls that I have watched or bid on. The seller has applied bat marks and field scuffs quite nicely. However, not one manufacturer’s mark is present on the ball which should cause prospective buyers to question the authenticity (eBay image). The other “sweetspot” has a “US” marking? Or, is this a different ball? The double-strike stamping over the top of the simulated game-use wear is a nice touch (eBay image). Considering my experience, I have a very solid comfort level in discernment and my ability to spot a ball that is anything but authentic. Considering my confidence, I know that I am lacking in many other facets of being able to authenticate baseballs and I have been taking steps to reinforce my knowledge through education. One source that has been invaluable is a treasure trove of knowledge, documentation, illustrations and photographs of baseballs produced and used by the major leagues, minor leagues, little leagues and even within the ranks of the military. As with any manufactured item, the manufacturer’s marks are a great tool for researching the item. With baseballs, one needs to pay attention to the manufacturer’s logos, word marks, trademarks and date (if present) in the imprinting on the ball. With game used balls, these marks can be difficult to discern but there is usually some portion of them visible with close inspection. This seller has a more believable ball in terms of simulated game-use. Pay attention to the crisp and freshly applied U.S. stamp on the sweet spot (eBay image). Only slight scuffing and minimal soiling is present on the cadencemilitaria baseball. Notice the lack of manufacturer’s marks (eBay image). The cadencemilitaria ball is a much better example of simulating game-use. Too bad the ball lacks anything that would give buyers confidence after they receive the ball in the post (eBay image). The “U.S.” is clear and crisp. Not one scuff or bat mark is visible on the ball. The dark brown dye is evenly applied (eBay image). Regarding the auction in the question posed by my collector colleague. Certain aspects of the ball are quite glaring and should immediately cause concern for even a layman (like me). In this auction, the ball has an extremely dark caste that is very evenly distributed around the entire ball. The coloring bears no resemblance to any game used ball that I have seen. The ball has a very clear and crisp stamping of a large block lettered “U.S.” that shows no signs of wear – another oddity considering that the ball is being presented as game-used. Lastly, the high-gloss sheen present on all of the ball’s surfaces indicate that it has been varnished or shellacked. This practice was a common method for preservation of autographs on balls but, but today is a highly frowned-upon practice. The repeated auction listings for these balls spanning a half-decade indicating an endless supply of WWII baseballs. There are several sellers attempting to cash in on collectors who lack experience and knowledge of these baseballs. As with any substantial purchase, research and knowledge are the best tools that one can use to save money. One other tool that people should rely upon is “gut instinct.” You have that for a reason. If you have a doubt at all, research to either allay or validate it. If you can do neither, let someone else waste their money. Wait for the ball that gives you a sense of authenticity. Ask the seller for provenance. Perform your due diligence and make sound decisions. Now that I have provided you with a number of auctions that (in my opinion) are at worst fraudulent or simply misleading, I am sharing some listings of balls that I believe to be genuine (post WWII) military baseballs (although they are lacking official stampings on the balls). To contrast against the three faked military baseballs, here is a game-used, signed and clearly marked baseball from the 1950s (eBay screenshot). More normal wear is shown on this “Official League” stamping on the sweet spot. This is very difficult to fake (eBay image). Aside from the signatures, this ball, though game-used, still shows the slightly worn and faded Wilson stampings (eBay image). In addition to the Wilson logo stamp, this marking indicates features of the ball’s construction (eBay image). This Rawlings Official League baseball is a prime example of an authentic game-used and autographed ball (eBay image). The ball is inscribed with the 1955 tournament play. It also shows the game use wear and faded manufacturer’s stamping (eBay image). Rawlings still incorporates their “RO” (Rawlings Official) in their present dayu baseball stampings. This ball shows some serious damage which could indicate use in later years (eBay image). United States Air Force Europe baseball tournament game was played in September of 1955 at the Erding Air Base in Erding, Germany (eBay image). The seller provides a little bit of context with the auction showing the grouping of baseballs and bats that were part of his acquisition (eBay image). As with the game, patience at the plate will serve you best. That fat and juicy-looking fastball might just break and fall out of the strike zone. If you’re swinging for the fences, you will strike out. These shady sellers are tossing garbage across the plate and you would be best served to take a walk to first (I have used far too many allegoric baseball references). To demonstrate that I too had some thoughts as to the veracity of these “coffee scuffballs” and the idea that they were authentic, I am sharing an article that I wrote a few years ago, “Skimming” Your Way to Overpaying for Militaria in which I lent a measure of credibility to the seller “giscootterjoe” and his endless bag-o-balls. Since I wrote that piece in 2012 (republished, here in 2016), I have been watching this seller with his continuous sales of these balls. “giscootterjoe” has been selling these balls for years. He sold four in the past 30 days for nearly $350.00. Business is booming! (eBay screenshot). Closer scrutiny of his eBay account shows that he sold 36 of these baseballs for a whopping $2,349.19 – that is an average of more than $65 per baseball. Please scrutinize every aspect of these scammers’ listings and past sales. I wrote this piece in hopes that my fellow collectors avoid spending their money on fakes. I want to be careful with regards to the sellers who have these listings that are, in my educated opinion, faked military baseballs. They may very well be victims of a fraudster, themselves and are merely eBay sellers trying to earn a living. However, the end result is the same. Trusting collectors are still purchasing fraudulent baseballs. Buyer beware seems to be the most applicable measure of caution that I can provide to you.